Our Community Advisory Committee (C.A.C) is a sub-committee of the Bass Coast Health Board of Directors. The committee works with and provides advice to the Board on behalf of the community. This partnership ensures broader community needs and expectations are considered in decision-making about the health service. Another essential role for the committee is to ensure that Bass Coast Health partners with consumers to ensure it delivers safe, high quality, appropriate and accessible healthcare. Health outcomes and experiences are improved if people are given an opportunity to be actively involved in their health care decisions. Health services and individual outcomes are at their best when consumers are involved in improvement opportunities and higher level strategic decision-making and governance. Caroline has lived at Newhaven for 49 years. Raising her family here, Caroline began by helping on local education committees and also worked as an administrator at Newhaven primary school for 25 years. Caroline’s extensive volunteering history includes, Scouting for 30 years, monitoring the 24 hour emergency radio at the Newhaven Yacht Squadron and is currently a local Justice of the Peace, volunteering at the Wonthaggi Police Station and witnessing locally. Caroline is also a Probus member and a Board member of the San Remo District Financial Services (Bendigo Bank). Caroline feels that having a family member living with Multiple Sclerosis (MS) has given her firsthand experience and understanding of the challenges of this disease and she offers her support to others as a member of the Face to Face Peer Support Group for people living with MS. Caroline has given enormously to the Bass Coast community for almost 50 years and was deservedly awarded the Bass Coast Citizen of the Year Award in 2011. Hilary has lived in the Bass Coast shire for 13 years. Hilary says she loves “…the mix and uniqueness of how our vast rural environment where it meets the water and the friendliness and caring nature of the Bass Coast community”. Hilary was motivated to join the C.A.C as she felt that it would provide her with a forum to have constructive input into the current and future direction of her local healthcare provider - Bass Coast Health. Hilary’s career focused on workplace-based mediation, rehabilitation and injury prevention. Most recently, Hilary has had the privilege of working as the Rehabilitation Advisor for Ambulance Victoria (AV) throughout the Gippsland Region. She says this has greatly assisted her knowledge of the challenges a vast region presents for people accessing health services. 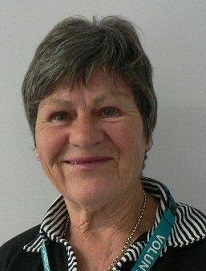 Joyce, a very proactive local volunteer, is involved with, Rotary, Phillip Island Community & Learning Centre Inc. (PICAL) (as President), the Newhaven Tourist Information Centre (as an Information Officer) and the Office of the Public Advocate (as a Community Visitor). Joyce brings extensive and diverse skills to the C.A.C, having worked as an Outreach Support Worker with Melbourne City Mission, Southern Mental Health Association and Peninsula Community Health Service, supporting people living with multiple and complex disabilities. With this experience Joyce ensures that our communication and strategic decision-making considers the complexities and diversity of people living in our community. Neil has been a Phillip Island resident for 25 years. He holds qualifications in Business Administration, Town Planning and Civil Engineering. Neil brings a diverse range of skills and experience to the committee, having been involved in a broad range of initiatives, including membership on the Wonthaggi L2P Mentor Program Steering Committee, president of the Peugeot Car Club of Victoria, a VCE/VCAA exam supervisor, the Wyndham Shire Quality Community Plan, the Bass Coast Shire Community Plan, President of the Municipal Engineers Association (Victorian Division) and the Maritime Emergency Services Review Committee. Currently Neil is Chair of the Westernport Water Customer Advisory Group and continues as a Volunteer driver with Bass Coast Health. Kate has lived in the Bass Coast Shire for 37 years. Kate has a Graduate Diploma of Health Education and worked at Bass Coast Health in Nursing for 26 years prior to her retirement, so has a particular interest in how we deliver health care to the community. A qualified Nordic Walk Instructor, Kate has assisted people to reach their goals with the Bass Coast Shire Council (BCSC) heart foundation group. Kate has actively participated in the community as a member of the local Probus and Voice Interests Education of Women (VIEW) clubs and raises money to help support the Smith Family. Kate regularly shares her warm disposition and smile by volunteering at Bass Coast Health’s Griffiths Point Lodge residential aged care facility in San Remo and attends Bass Coast Health’s Staff Orientation sessions and facilitates discussion on Partnering with Consumers and Person Centred Care with all new staff. Greg lives in Ventnor, Phillip Island and is married with 3 children and 4 grandchildren and among the many rewards Greg has received for his involvement in the community he was awarded the Order of Australia (OAM) Award in 2015 for over 30 years’ of volunteering. Greg’s extensive experience and knowledge through volunteering and working with war veterans and families ensures their health needs are considered in strategic decision making at Bass Coast Health. After joining the Royal Australian Air Force at the age of 19 and serving from 1965 – 1971, Greg worked as a Marketing and Advertising Manager at the Victorian headquarters of the Victorian RSL (ANZAC House) following on as Deputy CEO. Locally, Greg was the President of Phillip Island RSL for 8 years and the founding Secretary of the Vietnam Veterans Museum, Phillip Island. Greg has been extensively involved with the Royal Services League (RSL) and Vietnam Veterans Association (VVA). Bruce has lived in the Bass Coast Shire for 33 years. Bruce is a retired business man who spent 47 years with Australian Post in both country and state district offices within the Planning and Sales Department at their Head Office. During this time Bruce led a project introducing us to the now well-used PostPaks. After relocating, Bruce soon became interested in local community initiatives and has been a very committed volunteer, having twice served as President of the Phillip Island Lions Club, contributed as a past member of the Warley Hospital Committee and served 14 years as Board Director of Bass Coast Health (formerly Bass Coast Regional Health) and the San Remo District Financial Services Limited (Bendigo Bank). Bruce has a passion for history, and also enjoys volunteering with the Phillip Island & District Historical Society. Bruce was deservingly awarded the Bass Coast Shire Citizen of the year 2004 in recognition of his enormous contribution to our local community. In addition to being a Fellow of the International Association of Applied Psychology, Terry holds the Australian Defence Medal recognising his early military service and the Australian National Medal for his CFA service where he was the Captain of Langwarrin Fire/Rescue Station. Awarded a Life Governorship of the Ambulance Service to recognise his time as a Board Member of the Peninsula Ambulance Service has contributed to a keen interest in the provision of health services. This interest has lead to an involvement with Pastoral Care at Wonthaggi Hospital where each week he speaks with patients. Feedback from these conversations with patients is an added value to his role on the Community Advisory Committee. Recently retired from his international consulting practice in the area of human and corporate behaviour, he looks fondly back on a busy commercial life including his time as a vice president working in the world’s largest private company. Terry lives at Inverloch and enjoys surfing, vegetable growing, being a Justice of the Peace and active member of the Inverloch Lions Club. Faye is married, with 3 adult children, 3 adult step-children and 10 grandchildren. Faye worked for many years as a Radiation Therapist at Peter Mac and various private hospitals before moving to Grantville, where she has lived for 15 years owning and operating a beef stud farm. Faye spent 10 years as a member of the Grantville Community Emergency Response Team (CERT) and she feels this gave her broad exposure to the health needs of her community. Through this experience Faye has seen some of the difficulties accessing health services, particularly many elderly folk or struggling younger families. Faye’s community spirit has also found many other worthy local volunteering opportunities as well as a long history of holding a number of voluntary positions relating to her farming business. With this broad wealth of experience, Faye brings a diverse and unique skillset to our C.A.C. If you would like to contact a C.A.C member we can assist you. Please email quality@basscoasthealth.org.au or you may ring the Quality department on 5671 3365. Please don’t hesitate to say hello if you do see them out and about in the community.